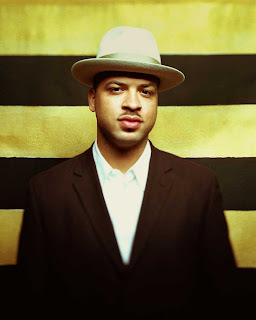 Jason Moran is snobby about chairs. He keeps a lot of photographs in the studio where he works. He learned classical piano as a child with the Suzuki method; he grew up hearing Glenn Gould at home and jazz on the car radio. His older brother played violin. One day, when Jason was 13 and bored with the piano, his parents played a recording of Thelonious Monk's “’Round Midnight.” It was the second most important moment in his life, after being born. In his words, it "set everything in motion." The facts of Moran’s life were projected on a screen in stenciled letters during In My Mind: Monk at Town Hall 1959, which came to the Walker Art Center as a shared presentation with the Northrop Jazz Season. Commissioned by Duke University, the San Francisco Jazz Festival, the Chicago Symphony Center, and the Washington Performing Arts Society, Moran's new work was originally supposed to be a re-creation of Monk's famous big-band concert of 50 years ago, with Moran playing piano and Monk's son T.S. on drums. But Moran went his own way. ("Technical re-creations can be a recipe for disaster," he wrote for the Guardian [London] in May 2008. "I thought of the Gus van Sant shot-for-shot remake of Hitchcock's Psycho.") Following his curiosity, digging into history, drawing on his knowledge of conceptual art (learned in part while composer-in-resident at the Walker in 2005, where he spent his free time exploring the museum’s collection), Moran created a multimedia work that combines words and music, sounds and images, past and present, biography and autobiography, concert and theater in a personal, lavishly inventive and musically satisfying take on a historic event in jazz. Last night at the Walker's intimate and lovely McGuire Theater, we heard Monk in conversation with his arranger, Hal Overton; we heard him tap dancing; we saw impressionistic images of the plantation in North Carolina owned by Archibald Monk, where the composer’s great-grandparents were slaves, and grainy images of Monk rehearsing in the Jazz Loft, filmed by W. Eugene Smith. Sometimes we saw double as the band we were watching was projected onto the screen; cameras were placed on either side of the stage, and to the left of the Steinway Moran was playing. All were interwoven with live performances of Monk’s music, interpreted and explored by Moran and his eight-piece Big Bandwagon. To start, Moran came on stage alone, put on a pair of headphones, listened to Monk play “Thelonious” (we could hear it, too, barely), then improvised along with the music. The other band members entered and began playing and the music expanded to fill the room. Throughout the evening, the octet reformed into small groups, sometimes classic trio (piano, bass, drums), sometimes all horns (trombone, tuba, alto and tenor saxes). There was much room for improvisation during solos and musical conversations, times when Monk's tunes opened up and new music, some invented on the spot, rushed in. At first I was surprised that Tarus Mateen played electric bass, not upright; it brought a more modern sound to the mix and left room for the rumbly low notes of Howard Johnson’s tuba. They played the music Monk and his band performed during the original 1959 concert: “Thelonious,” “Friday the 13th,” “Little Rootie-Tootie,” “Monk’s Mood,” “Crepuscule with Nellie.” All were re-imaginings, not reiterations; “Crepuscule” was full of old-time gospel fervor, and parts seemed almost symphonic, lush and full. Throughout the night, Monk’s music (which Ben Ratliff has called “some of the best songs ever written in jazz”) was the core, not an enclosure. We also heard new music: to a recorded reading of a poem titled "In My Mind" (solo piano), and to the scenes of fields on Archibald Monk's plantation (tuba and cowbells). One of the things that makes jazz so interesting (to me, at least) is its wide-openness to interpretation and reinterpretation. I’m guessing that most contemporary orchestras play Bach and Beethoven, Mozart and Shostakovich fairly straight. All the notes, nothing more and nothing less. A jazz tune, on the other hand, is a sketch, an outline, a compass pointing north. Classical musicians have scores. Jazz musicians have fake books—melodies, lyrics, basic chords. The rest is up to them. Listening to the solos—Moran’s brilliant, unpredictable piano, Nasheet Waits’ fierce and thundering drums, Ralph Alessi’s shining trumpet, and Isaac Smith’s joyous, unfettered trombone (to me, the dreadlocked, exceedingly animated Smith was the highlight of the evening)—I wondered, if Monk were in the audience tonight, what would he think? Would he enjoy the sound of his music filtered through the intelligence and experience, imaginations and mad skills of these eight musicians? Part homage, part documentary (thanks to the newly discovered recordings and images Moran was able to use), part confessional (Moran saying “This is where I came from, this is what I care about”), In My Mind stands on its own as a new work grounded in tradition. It's Monk brought into the 21st century, tap-dancing feet and all. 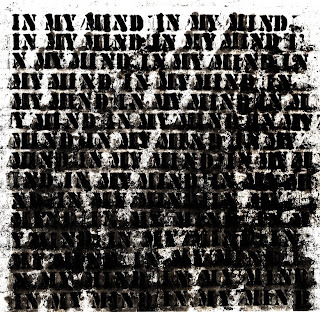 Hear clips from In My Mind. Read about the Jazz Loft and the things that were found there. See and hear Moran in conversation with Walker Art Center Performing Arts Curator Philip Bither in February 2007. Photos of Moran and the "In My Mind" painting from Moran's website. I wish I could've made this concert. I also like the culture of re-imagining, which takes place in jazz when all is going well, and is also in hip-hop, electronica, etc. I think classical musicians would claim they have wider latidude for re-interpretation than you are giving them credit for (e.g., Glenn Gould's mozart is aggressive), but I personally agree it is more circumscribed. There is also a strain of jazz that is more circumscribed (play the standards like the record), and that is my less favorite. Fortunately in this town we are surrounded by lots of creativity and openness. I'm sure I have grossly underestimated what goes into classical music performance...though Kelly Rossum has said more than once that classical music is about perfection, and playing the notes perfectly. So there's room for interpretation but not improvisation? I enjoy other forms of re-imagining as well...poems about paintings, for example. (Like William Carlos Williams's "Pictures from Brueghel.") And writing about jazz, I suppose. Play-like-the-record is what people who go to pop concerts want. I had a conversation with my son recently; he had gone to the Medeski show at Troc's and was disappointed because he didn't recognize any of the songs. He wanted to hear songs he knew, played in ways he recognized. (Not too likely at a Medeski show, come to think of it.) I enjoy hearing songs I know, but played in ways I don't immediately recognize.